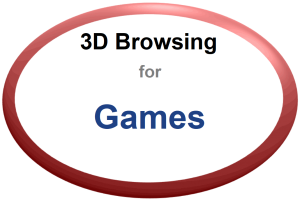 3D Browsing is the new way to experience the Internet! Tired of clicking a link and seeing a blank web page while the new web page loads? 3D Browsing provides a whole new experience. It is like combining a 3D Game with browsing the Internet. 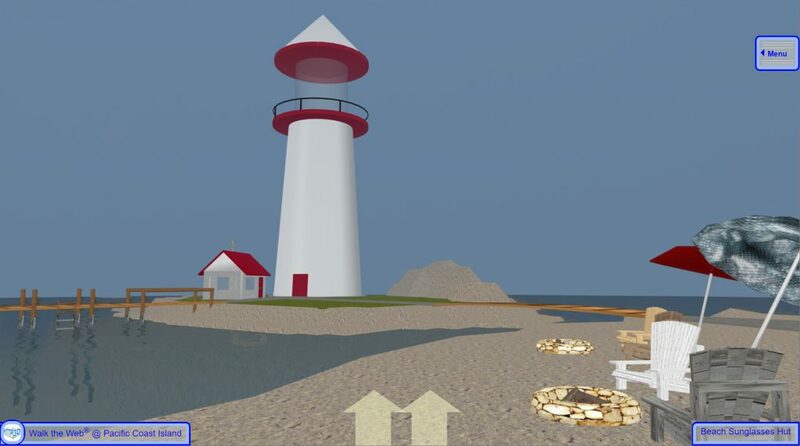 3D Communities, 3D Buildings, 3D Things, and 3D Games load as you WALK closer and unload as you WALK away! That is the Patented concept behind our 3D Browsing. 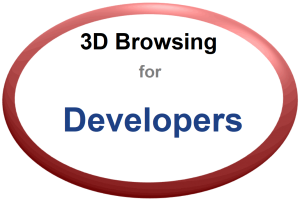 Despite its looks, 3D Browsing is not just a 3D Game! It is a new way to explore the Internet! Imagine towns of on-line shopping, museums, organizations, art galleries, businesses, and houses mixed with social media, amusement park rides, draw bridges, virtual golf courses, bowling alleys, cars, boats, and 3D Games. We are building it. We hope you enjoy the 3D Websites and 3D Browsing. Roll your mouse Wheel (Scroll Wheel) forward or backwards to WALK. 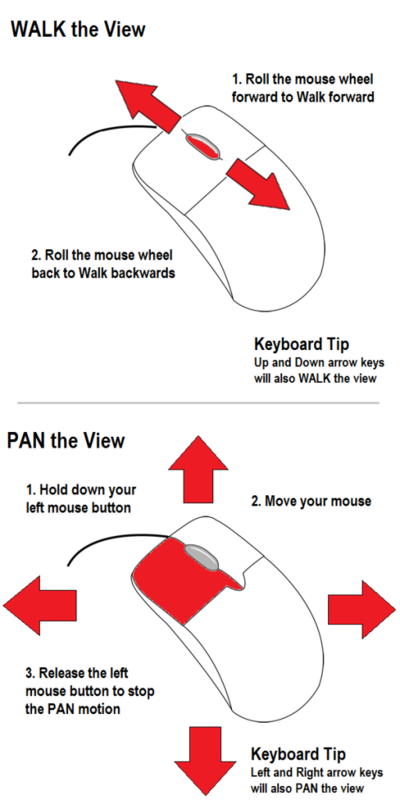 Hold down your left mouse button and move the mouse to Pan the View or look around. Release the mouse button to stay facing that direction. Left click 3D Object to interact or select something where available (Just like clicking links and pushing buttons). Use the up and down arrows or W and S keys to Walk forward and backward. Use the left and right arrows or A and D to Pan the View or look around. Hold down R or F to look up or down. Use Tab and Enter to interact or select something where available (Just like clicking links and pushing buttons). Move up or down on the left-side of screen on your touch screen to Walk forward or backward. Move up, down, left, or right on the right-side on your touch screen to Pan the View and look around. Touch a 3D Object to interact or select something where available (Just like clicking links and pushing buttons). Social Media functions coming soon! 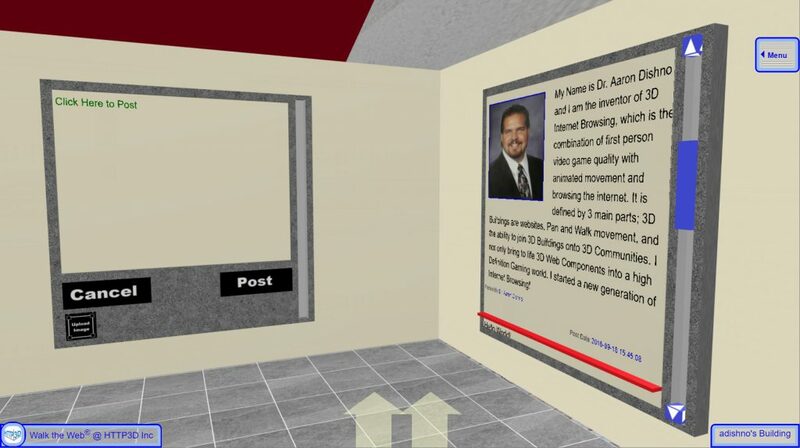 In the near future you will be able to post messages and read other messages from within your own 3D House.